This is the first part of the Wilkes-Barre/Scranton Penguins regular season wrap up. It will focus on the highlights and lowlights of the 2009-2010 Penguins regular season. A more detailed edition (statistics, team grades, etc.) 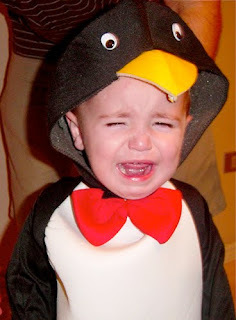 will be published after the Baby Penguins are eliminated from playoff contention. The regular season came to an end for the Wilkes-Barre/Scranton Penguins on Sunday as they defeated the Binghamton Senators by a score of 3-0. As Baby Penguins fans, players, and coaches look ahead to the Calder Cup playoffs this upcoming Wednesday; let’s take a look back at some of the greatest and not so great, moments from the first 80 games. 5. October 29 (at Manitoba): Ryan Bayda scored the game’s only goal 39 seconds into overtime to give the Penguins a 1-0 win over the defending Western Conference champions Manitoba Moose. John Curry turned aside 23 shots for his first shutout of the season. 4. November 11 (Portland): Three Wilkes-Barre/Scranton rookies (Brian Strait, Zach Sill, and Eric Tangradi) scored their first professional goals in a 6-1 thumping of the Portland Pirates. The game also featured four fights; including fellow rookie Lane Caffaro getting his first professional fighting major. Wade Brookbank received a game misconduct for having his fight strap come untied during his scrap with Jeff Cowan. 3. February 13 (Hershey): The Penguins picked up a stunning win against Hershey by shutting out the Bears 5-0. 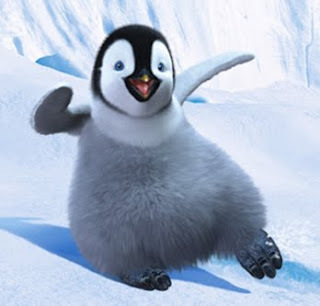 Five different players (Wyatt Smith, Dustin Jeffrey, Chris Conner, Jesse Boulerice, and Eric Tangradi) scored for the Penguins. Brad Thiessen stopped all 29 Bears shots for his first AHL shutout while Braden Holtby had a rare off night stopping only 15 out of 20 shots. 2. March 19 (Springfield): After falling behind 4-1 at the end of the second period to one of the worst teams in the league, the Penguins charged back to take a 5-4 overtime win from the Falcons. Nick Johnson led the comeback with two goals for the Penguins while Mark Letestu racked up two assists. Deryk Engelland scored the game winning goal 4:26 into overtime. The Pens put up 55 shots on Springfield goaltender Jean-Philippe Levasseur. 1. February 17 (Albany): The Penguins set a record for goals in a game as they defeated the Albany River Rats by a score of 9-2. Chris Conner became the first player in Penguins history to tally six points in a game with a hat trick and three assists. Luca Caputi (2+2) and Wyatt Smith (1+3) both had four point nights while Mark Letestu and Dustin Jeffrey (1+2 each) had three point nights. Brad Thiessen stopped 30 of 32 Albany shots. 5. February 5 (Syracuse): After getting out of the first period with a 1-1 tie with the Crunch on a power play goal by Nick Johnson, the Pens collapsed in the second period. They allowed three straight Syracuse goals to give the Crunch a 4-1 lead. The crowd at the Mohegan Sun Arena, rightfully disgusted with the way their team was playing, booed the team off the ice at the end of the second period. However the team did not respond; losing the game by the same score. 4. February 10 (at Norfolk): Despite two goals from Nate Guenin, who would play his last game in a Penguins uniform, the Pens fell 5-3 to the Admirals and found themselves dangerously close to last place. The Penguins held a 2-1 lead and even managed to tie the game 3-3 early in the third period, but the completion of a Justin Keller hat trick and a Juraj Simek power play goal gave Norfolk the win. The Penguins dropped their third straight game in the loss. 3 (two games tied for number 3 spot): In two games this year, the Penguins allowed last second goals that prevented them from getting out of the game with at least one point. On December 13 against the Adirondack Phantoms, the Pens were swept in a two game set when they gave up a Danny Syvret goal with 0.01 seconds remaining to lose 3-2. On March 28 against the Worcester Sharks, the two teams were deadlocked at 1-1 when Ryan Vesce scored with nine seconds to go. 2. January 17 (at Springfield): Two power play goals from Chris Conner gave the Penguins a 2-1 lead at the end of the first period. Unfortunately, the Pens allowed three goals from Chad Wiseman; in addition to Wiseman’s goal which opened the scoring, to give Springfield a 5-2 lead. Dustin Jeffrey scored a shorthanded goal at 12:43 of the third period but the Penguins could not muster anymore offense. The loss meant the Pens had failed to pick up any points in a three in three for the second weekend in the regular season. 1 February 7 (at Hershey): The Penguins came into a snowy Hershey, Pennsylvania and skated out to a 3-0 lead by early in the second period. Suddenly, their confidence was shattered as Hershey scored three goals in under three and a half minutes for a 3-3 tie after two periods. In the third, the Bears continued attacking as Mathieu Perreault completed a hat trick to take over the game with a 4-3 lead. Chris Conner tied the game 26 seconds after Perreault’s third goal, but Bryan Helmer sealed the deal for Hershey at 18:56 for a 5-3 win. The Penguins’ great moments were not just limited to the five games listed above. What else can we not forget about our 2009-2010 season? October 3: The Pens open the season with a 4-2 victory over Syracuse. Wyatt Smith led the Penguins with two goals while Keven Veilleux scored his first professional goal in his first professional game. Four other Penguins (Brian Strait, Zach Sill, Eric Tangradi, and Robert Bortuzzo) also got their first AHL points with assists on various goals. December 26-30: The Penguins put together their first four game winning streak of the season. All of their wins came against division rivals; including two against Albany and victories against Adirondack and Binghamton. February 11: Defenseman Steve Wagner joins the Penguins in a trade that sent Nate Guenin to the St. Louis Blues organization. With the new addition, the Penguins went 6-0 from February 12-February 21; getting key wins over Binghamton, Hershey, and Albany. 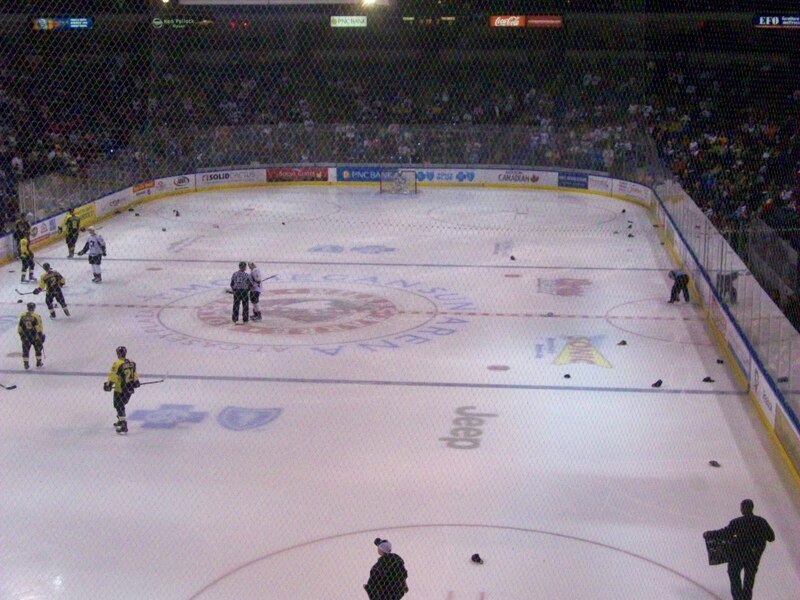 February 27: Chris Conner scored his second consecutive home hat trick as the Penguins defeated the Providence Bruins by a score of 5-1. 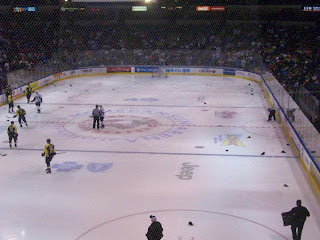 Former Penguins goaltender Dany Sabourin was pulled in the second period in a rude welcome back to Wilkes-Barre. February 28: Former WBS Penguins players Marc-Andre Fleury, Ryan Malone, Brooks Orpik, Ryan Whitney competed in the gold medal game in the Winter Olympics. Other former Penguin Olympians included Konstantin Koltsov and Miroslav Satan. I would like to conclude part one of my season wrap up by presenting the first of the many awards I will be giving out. The “Thanks for the Memories Award” for my personal favorite highlight: I had liked this particular player almost as soon as I saw him in action during the 2009-2010 season. My approval of him only grew as he made an impact on the Pittsburgh Penguins and as he had big nights in two consecutive home games. It is my pleasure to present the “Thanks for the Memories” award to CHRIS CONNER and his two consecutive home hat tricks on February 17 and February 27. Thank you for joining me in recognition of the highlights of the WBS Penguins 2009-2010 regular season. I hope you will stay around after the Baby Penguins postseason run as we grade the team and look ahead to the 2010-2011 season.